I always think about Bánh Mì sandwiches. I used to grab these things for a quick lunch on Irving St. in the Sunset District of San Francisco as a kid. Primarily because it was cheap ($2.50), had a ton of mayonnaise, and had bbq roast pork in it. When I got older, my taste buds started to change and I became more obsessed with finding the best Bánh Mì. It couldn’t just be a regular Bánh mì. It had to have the perfect toast on the outside of the bread, with the fluffiest center. The pickled daikon and carrots had to be crisp and balanced, and the meat had to be soaking in the mayonnaise and dripping from the sandwich. As a Vegan, options are unfortunately limited for a juicy bbq pork Bánh mì and that was sad. So, I took it upon myself to scout out some of the best plant based ingredients to bring back my youth and relive the glory days of having a Bánh mì every week! There’s a local Asian market close to me called, May Wah, and I swear, I can find ANYTHING here. More importantly, I can find the perfect ingredients to make a Vegan Bánh mì, good enough to rival with any Bánh mì this world has seen! In the frozen section, I stumbled across a Vegan Char Siew….Char Siew in Chinese cuisine is basically bbq pork with five spice seasoning. Slicing this stuff up on the first go around, I was shocked at how closely it resembled bbq pork! Literally mind blown! Next up was of course finding the best bread for the job. In the Bay Area, Bui Phong Bakery seems to be everywhere, and for good reason too, because their bread is PERFECT. Alright, so let’s get started. First up, we’ll want to tackle the pickled daikon and carrots. It would be really convenient if you did this step the day before to allow the pickles to…well, pickle. Just slice up the carrots and daikon fairly thin. We’ll make a simple pickling juice with apple cider vinegar, sugar, and salt. I sometimes use rice vinegar for a more acidic punch. We’ll whisk up the marinate in a small bowl. Place the julienned carrots and daikon, into a mason jar, cap it, and give it a really good shake. In this recipe, there should be just enough daikon and carrot for a 16 oz. mason jar. Next up, get some really crisp cucumbers like Persian cucumbers and slice them thinly. I like to just quickly half the cucumber lengthwise then slice 4-5 slices per half. Now for the flavor bomb of lemongrass. Yes, I’ve been obsessed with lemongrass. It’s now come to a point where if my fridge is out of lemongrass, I’m running to the Asian market right then and there. Just mince up about half a stalk of lemongrass really fine. What we’ll do with this is quickly fry it in some oil, and add the Vegan bbq “pork” into the pan to make this sandwich really special. As you drop in the bbq “pork” let the pieces sear and get a little char going on each side. You’ll want to turn the pieces over every 2 minutes to achieve this result. After about 4 minutes, drop 1 tbsp of tamari and 1 tsp of agave. Give everything a quick toss and final sear. The tamari and sugars should start to char the surface of the “pork” too and that’s exactly what we want. Kill the heat and let’s now prepare the mayonnaise. Traditionally, Bánh mì sandwiches will always have jalapeño but I was never truly a fan of biting into a big piece of jalapeño. Instead, we’ll use a Sriracha mayonnaise to give us the heat and twang that we’re looking for. Just four tbsp of Vegan Mayonnaise and 1/2 tbsp of Sriracha mayo should do the trick. If you like more heat, add 1 tbsp of Sriracha instead and give everything an even stir. For the final steps, we’ll want to toast our bread in the oven at 350 degrees for about 4-5 minutes. It will be easier to cut the bread in half first, before placing it into your oven. While that’s toasting up, we’ll prepare our fresh cilantro by plucking the leaves and giving them a quick rinse. Fresh cilantro is super critical and if you can find really fresh cilantro with the roots still on it, you’ll be a happy camper! To build the sandwich, we’ll coat the inside of the bread with a generous spread of Sriracha mayo. Throw the “meat” in first, add the pickled carrots and daikon, then add the cucumber with the cilantro on top. For the finale, sprinkle some Maggi seasoning sauce over the cilantro. In my opinion, there’s no such thing as, “too much Maggi sauce.” This stuff is potent, so let’s say 6-8 drops should be good for the job. 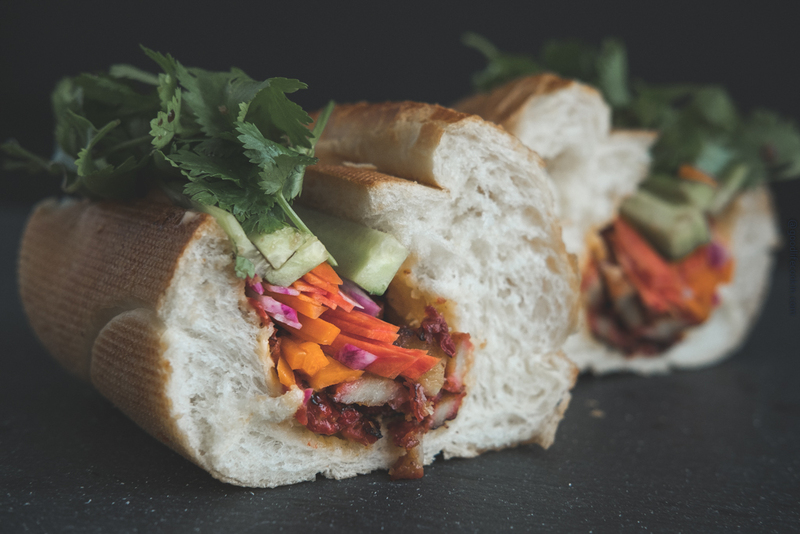 Give the sandwich a nice chop down the middle and we’re ready to crunch down on some amazing Bánh mì! That light fluffy bread with the perfectly toasted outside, filled with some potent lemongrass seared bbq “pork!” IT DOES NOT GET BETTER THAN THIS! A traditional Vietnamese sandwich containing all the fixings and more! Peel carrots and daikon. Cut into thin, two inch strips. Place into mason jar, upright. In a small bowl, whisk together apple cider vinegar, water, salt, and sugar. Pour mixture into mason jar. Cap jar and shake vigorously. Place in fridge and let marinate overnight. Slice Vegan char siew, and set aside. Prepare 1/2 stalk of lemongrass by finely mincing. Heat 1 tbsp cooking oil in pan over medium heat. When oil is hot, add lemongrass and stir for 10 seconds. Add in Vegan char siew and sear for 2 minutes on each side. When slightly charred, add in soy sauce and agave. Cook for additional 2 minutes or until soy sauce slightly burns. Rinse fresh cilantro and remove stems. Slice cucumbers in half, lengthwise, then in quarters to create thin slices. Prepare bread by slicing in half 3/4 of the way through center. Toast in oven for 5 minutes at 365 degrees. While waiting for bread, mix Sriracha and Vegan mayonnaise in mixing bowl. Set aside. When bread is fully toasted generously spread Sriracha mayonnaise. Layer in Vegan char siew, pickled vegetables, cucumbers, and top with handful of cilantro. Add in Maggi Seasoning to taste.